Yangikala Canyons are amazing natural objects in the North West of Turkmenistan in the Balkan region. Yangikala means “fire fortress”. So interesting name canyons were given because of red color of rocks, from which are formed mountains ranges and cliffs. After leaving Balkanabad, you will suddenly find yourself in the steep cliffs. There used to be the waters of the Gulf Karabagazgol - part of the coast of the Caspian Sea. Today here you can see steep banks and huge hills. Due to rain, wind, waves, there were formed fanciful castles, towers, walls. Yangikala Canyons are incredibly beautiful sight. The most interesting thing that depending of the time of day, the color of the rocks is changed right before our eyes from pure white to fiery red. It is especially beautiful at sunset, when everything is colored in fiery tones. 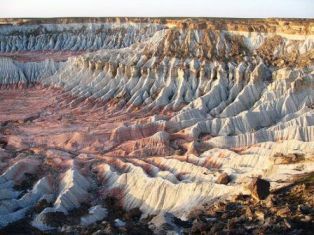 The sight like this one can see in Chinese Xinjiang, also known as "fire mountain".